Early morning on the bay is always beautiful but it's even better when you are the only one out there. This photo is taken from the eastern side of the bay looking north toward the power lines. I had gone out to check on some birds on the sandspit but all I found were lots of bird footprints and one set of human prints on top of them. So I kayaked to the other side of the bay and just enjoyed the scenery. It was very still and the close ripples were made by me manoeuvring the kayak into the right place to take photos. Even though there is actually a limited number of species at any one location they seem to grow into an endless variety of shapes and sizes. 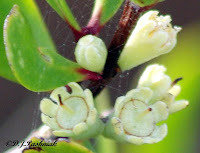 I am still trying to sort them all out but determined this season to get photos of the flowers. (btw I do NOT find it easy to sit in a kayak and try to hold the camera still enough for close-up photos!) 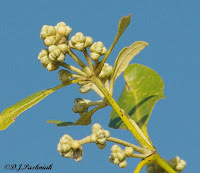 These buds were on Gray Mangroves (Avicennia marina) the other week but when I found the flowers opening a few days later they had all darkened and only a few flowers at a time were opening and then quickly darkening. This one had me puzzled for quite some time. Its leaves were much smaller and did not look like the other mangroves but it was growing out of the water. 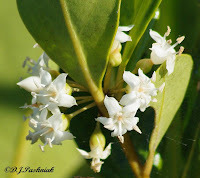 It is the Myrtle Mangrove (Osbornia octodonta) with aromatic leaves and very tiny flowers. I am using the revised edition of Mangroves to Mountains - a Field Guide to the Native Plants of Southeast Queensland - to ID these plants. Please correct me if I have made mistakes. They sat up there for few minutes and screeched in their usual noisy fashion and then flew off. One of them was left behind and didn't seem to realize that the others had already gone. It climbed into the top of the tree and called for them. 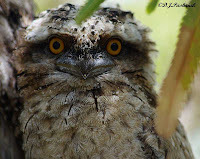 The Peewees (Magpie-Larks) didn't like this noisy neighbour and launched an attack. The Cocky almost fell out of the tree in its hurry to get away. It looked like a bunch of black feathers. 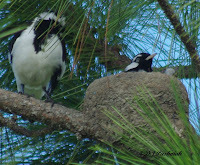 Meanwhile the Peewee returned to its nest and reassured its mate that it had chased off the intruder. The weather has been perfect for more than a week and early high tides have made great opportunities for kayaking. I had a successful bird count on Sunday - although did not find the numbers of birds that I have seen at this roost on previous years. Then Monday we had very graciously been offered a boat to take us to three roosts that we don't usually count as they are all a distance away and accessible only by water. I was certainly looking forward to this and expecting to see large numbers of shorebirds at these three roosts. It was a beautiful day and we saw some beautiful scenery with an expert skipper to take us around. The Carlo Island Complex roost was first but unfortunately we did not see any birds. The boat was just too big to get through the mangroves and there was not enough water to get around them! The boat skipper said that in his opinion only a little flat bottom punt would get where we wanted to go. This was the first disappointment. Oh well, off to the Smooger's Point roost next. It is nearly a year since I have kayaked here and I expected similar numbers and species of birds as I saw then. Disappointment again! Two birds only - a Grey-tailed Tattler and a Red-necked Stint. I have no idea why the birds were not at this roost. The third roost was at Seary's Creek and I expected to see Whimbrels here. We counted 240 Whimbrels, 80 Grey-tailed Tattler and 17 Common Greenshank. At least we had found birds at this roost - but where were the others we expected to see? Which roost were they using with this kind of tide height? The next day I drove around to Inskip Point to see how much of the sand island was out of the water at high tide and what numbers of birds were using it. I did not expect to do a count from the shoreline as my equipment is not good enough at that distance but I could estimate general numbers. Once again there were far fewer birds than I had expected but the reason was obvious to see. A boat was anchored on one side of the island and there were 4 people out walking and finding suitable places to fish! This is where fickle fate decided to be kind! I walked through the bush to the point and back again. 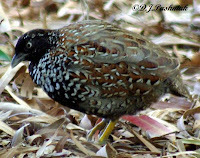 It was late morning and very hot so not too many bush birds were stirring - BUT - I saw three different lots of Black-breasted Button-quail! This is more than I have ever seen before and I got some photos - one quite good one and a couple of "interesting" ones. The first photo is a male, the second is a male and a female, and the third one I am not sure of. The color is a little different and I am wondering if some are juveniles? Any suggestions welcomed! 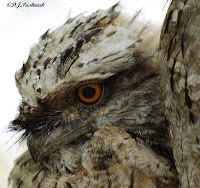 A friend phoned me the other day to say that the Tawny Frogmouths (Podargus strigoides) had nested right outside her house again. 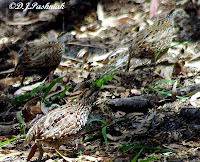 The young ones fledged and then the parents took them out of the tree where they had nested and around the back of the house into more bushy grevillea trees. This lady has no pets and the birds obviously feel quite safe in her yard. When I went around to get some photos they were at about head height and were quite used to her going quietly to have a closer look at them. The young ones opened their eyes wide and looked at us but the parent looked out of half closed eyes and then closed them right up again and took no further notice of us. 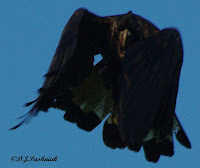 These birds are nocturnal so they are usually very hard to see. Yesterday was another beautiful day with an early high tide. I kayaked around to the Mullens bird roost where there was a good variety of shorebirds. Before I got anywhere near the roost I could see birds flying up from behind the trees. When I got around to the roost I soon saw a Whistling Kite flying over the roosting birds then calling loudly as it zoomed away. Of course all the birds flew up and then resettled somewhere else. Each time I thought I would be able to approach some of the birds without disturbing them the Kite flew over again and the birds disturbed and flew off again. I saw Bar-tailed Godwits, Eastern Curlews, Great Knots, Lesser and Greater Sand Plovers, Sharp-tailed Sandpipers, Pacific Golden Plovers, Red-necked Stints and Red-capped Plovers. The larger birds were roosting in flocks together and the smaller birds were off by themselves on dry land in amongst the saltmarsh plants. 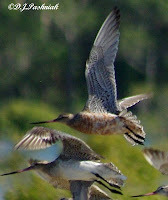 The really exciting find of the day was a Godwit going into breeding color. This is the first one I have seen this season. Sorry for the quality of the photo! It's the only view I had of this bird. I kayaked over to the Carlo Island roost site yesterday. I wanted to see if I could find a way through the mangroves to the other side of the Whimbrel roost and also to the north side of the bay where we went in a 4 wheel drive vehicle last month. No, I could not get to the other side of the Whimbrel roost but, Yes, I found a way to the north shoreline. 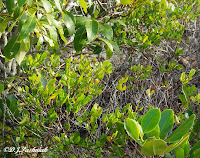 There are a number of different mangrove varieties in this area with quite different growth habits in different areas. The mangroves where the Whimbrels roost are quite distinctive. They don't have rounded crowns as most mangroves do but almost look to be broken off at the same height - although there are some higher branches where Whimbrels roost and watch for any disturbances. There are thick stems/trunks visible so they are not just young trees. There is new healthy growth all through the area so they are not dead or dying trees. It is only in the roost area that the trees are like this. Surrounding areas have larger well-shaped trees as well as much smaller and younger trees. I would be interested in any opinions as to the reason - from those who have more knowledge about mangroves than I do. When I kayaked through the mangroves to the north shoreline I found the Godwits and Eastern Curlew were roosting in the shallow water at the edge of the bay. I stayed well away so I didn't disturb the birds - the Godwits stayed where they were but some Eastern Curlew flew. 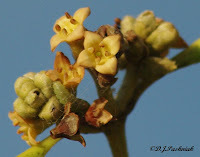 I saw a number of Orange Mangroves (Bruguiera gymnorhiza) with both flowers and fruit on them. The red colored flowers made a nice contrast with the dark green leaves. Next to these Orange Mangroves were some with white flowers (not yet open) and much longer fruit - Red Mangroves (Rhizophora stylosa) I think - although I am still having trouble identifying some of the mangroves. While paddling slowly and quietly through these mangroves I saw a Striated Heron. This one let me get quite close without showing any signs of being disturbed. It turned and looked me over and then went back to looking the other way. The round trip was a bit over 6 kilometers and the hardest part is always getting the kayak back up on the car! This photo is looking from the Carlo boat launch back towards Tin Can Bay. 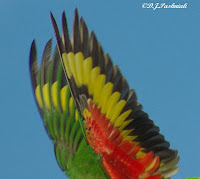 The Rainbow Lorikeets were in the red flowering callistemon the other morning. I thought it would make a nice colorful photo and was waiting for this one to get in a better position. I noticed movement close-by and then saw another bird had caught a very small branch at the top of the tree and was hanging upside-down. If ever there was a "look-at-me" moment from a bird this was it! A real "show-off"! It then demonstrated how it could easily hang on with only one leg. I wasn't quick enough to catch a full photo as it flew off but just managed to get these wings in the bottom of the frame. Slightly out of focus! - but it shows the beautiful under-wing colors. 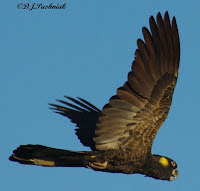 For more bird photographs visit the Bird Photography Weekly. For those who regularly read my posts you will know that I have been complaining about the lack of rain for months past. Well we have just had the first "proper" storm for a long long time! 50mm (2 inches in the old scale) in about half an hour! Delightful!! Yesterday was one of the highest tides of the year. However, according to the tide charts there will be one a little higher at the end of the month. 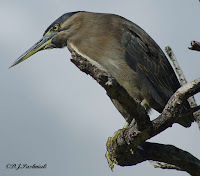 That one will be well worth seeing too and since it is a little earlier in the day may even give an opportunity to kayak around to some bird roosts. High tide yesterday morning was about 10:30 and even a bit later at the head of the bay and by that time there was quite a lot of wind. Down at Norman Point low lying land was totally covered. The grass at Crab Creek was well covered. The entrance to the boat ramp at Mullens was totally impassable. Trees like this don't normally stand in sea water. The strip of sand where we walk to the Mullens bird roost was gone.